The Mid War books are all comprised of units and formations that existed and were deployed during the period 1942-43. This is despite the fact that we have organised the content of the books along thematic lines. Think our example list isn't zany enough and you can do better? Use any legal combination of Command Cards and Army Books to create your own unusual historical list and send it in to [email protected]. 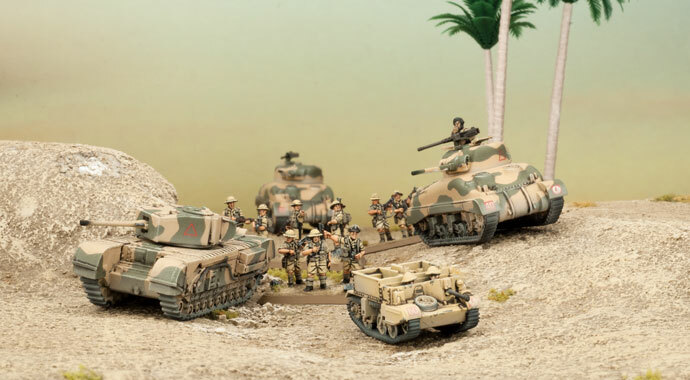 We'll pick our favourite next week and send the winner their choice of V4 Mid War Army Deal and Army Book. To use the Germans as an example, any Formation from any German Mid War book can be used in any Mid War German force. You are also welcome to take any support option from any German Mid War book to support any German Formation from any other Mid War German book. This may sound like a big thing, but the Ghost Panzers book allows you to field anything from Iron Cross, and the only thing not in those two books but in Afrika Korps is the Afrika Rifle Company Formation and Platoon, and the 15cm (SF) Lorraine Schlepper Artillery Battery. So, what can I do with this freedom? As an example, I can take a complete Afrika Rifle Company from Afrika Korps as my primary formation, with a StuG (Early) Assault Gun Platoon from the support options in Iron Cross, along with a Black Box platoon of Panthers from Ghost Panzers as Formation Support. I could even take a platoon of the Community Card Panzerjäger I Tank-Hunters in support from the website. 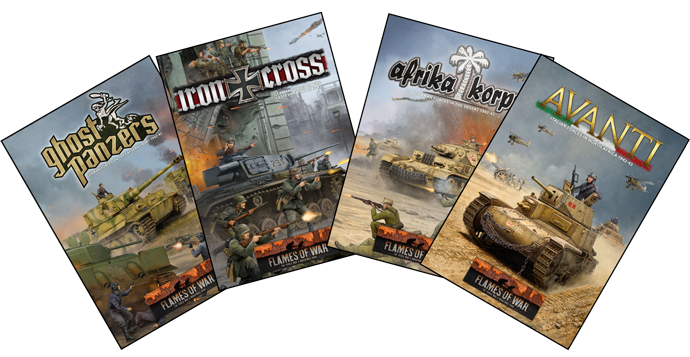 Since Iron Cross and Ghost Panzers share identical support, and Afrika Korps adds only one different Support Unit, the Support options are considered to be shared between all three when building a list across books. You can't take the same Support Unit three times, once from each book. Command Cards have added the ability for players to include a amazing amount of flavour and interesting options into their lists representing a wider variety options that could be contained in a normal Intelligence Handbook. 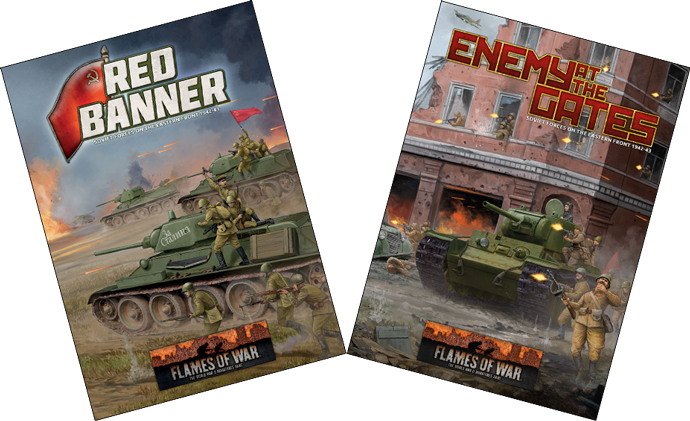 Check out this article on how you can use command cards to offer flavour, variation, and special skills to your Flames Of War force. While on the face of it this may appear to be an ahistorical force for the Desert Campaign, with fieldgrey uniforms and a lick of dunkelgelb, it is actually a perfectly reasonable and historical late-1943 Grenadier force on the Eastern front, applying the same few men/many tools operating philosophy of the Afrika Korps after having been ground down by Soviets. The support options of Panthers, StuGs, and Panzerjägers could all be seen on the Eastern Front. The same principles apply to building forces out of both Enemy at the Gates and Red Banner for Mid War Soviets. For example, I could take a Rifle Battalion from Enemy at the Gates as one Formation, with a Reconnaissance Company from Red Banner as my second Formation, along with an SU-85 Tank-Killer Battery from Red Banner as support and a Compulsory Unit like the Storm Group from the Enemy at the Gates Hero Rifle Battalion as Formation Support. This would be a great force to represent a fresh rifle division spearheading the assault on Smolensk. 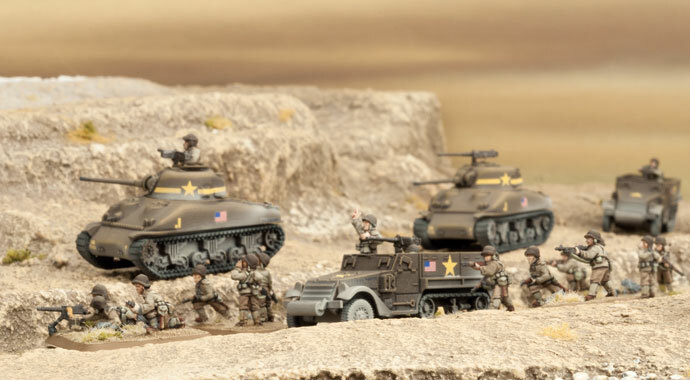 In both cases, although these units were divided for thematic reasons into their own books to maintain accessibility; historically, with few exceptions, many of the units were seen together on the battlefield during the 1942-43 period. As such, cross-book list-building can be used to represent forces reorganised and deployed in different scenarios. Creating an international force with allied Support is slightly different, but follows the same basic principles. Forces may include elements from any book also belonging to the same group as the base Formation in the form of an entire Allied Formation or a Compulsory Unit from an Allied Formation as a Support Unit. Germans can take Italians as an Allied Formation or a Compulsory Unit as an Allied Support Unit, British can take Americans as an Allied Formation or a Compulsory Unit as an Allied Support, Italians can take Germans as an Allied Formation or a Compulsory Unit as and Allied Support Unit, and so on. Soviets can not take any external elements. For instance, I can take a British Motor Company from the Armoured Fist Force Diagram as my Formation, and then add an M4 Sherman Tank Company from Fighting First as an Allied Support Formation. This would be a British force with a US Allied Formation. Since I’m building my force from the Armoured Fist Force Diagram, I can only take British Support Units to my force (so no American M7 Priests for example, one can never take Support Units from another force diagram), although I could take an Armored Rifle Platoon or M10 3-inch tank destroyers as an Allied Unit since they are Compulsory Units in US formations. If I had chosen the Fighting First Force Diagram initially, then the Motor Company from Armoured Fist would be my Allied Support Formation and I would only have access to US Support Units from the Fighting First Force Diagram. These same rules apply to Italian Forces taking German Allied Support Units or Formations from any German Mid War book or German Forces from any German Mid War book taking Italian Allied Support Units or Formations from Avanti. A main feature of V4 has been giving players the liberty to build the forces they want to build without prescribing what those forces have to look like it too great a level of detail. For now, I'll leave you with a few words from Chairman of the Battlefront Group, Peter Simunovich. 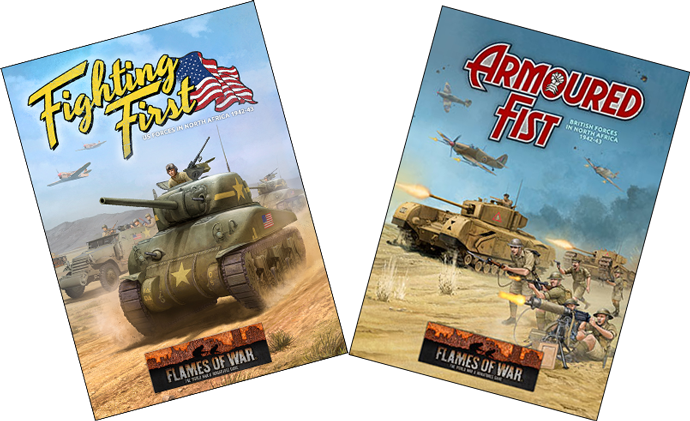 'Overall, list-building in Flames Of War is intended to give players the ultimate freedom to play the way they want, and we are committed to supporting the community whatever path they choose to take. 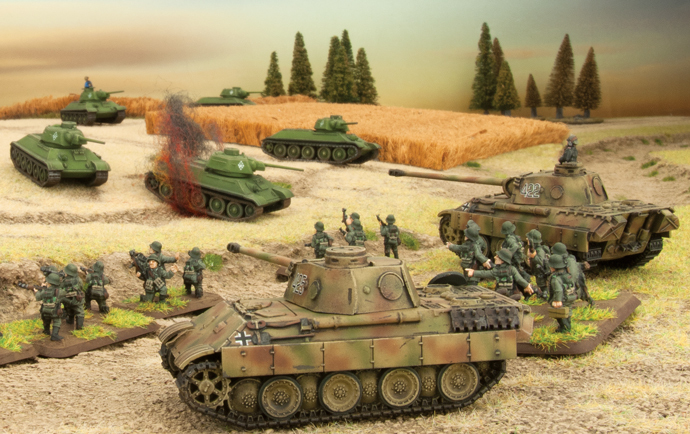 The units on offer in Mid War mean that most combinations will result in a historical force, and players are more than welcome to run historical-only lists. Even so, players who want to put together the most cost-efficient, tournament-winning, list regardless of historicity are also able to do so in Mid War. 'In the end, it’s up to you and those with whom you play to decide how you want to play Flames Of War— we own the rules, the community owns the game'.